Those are the words of the poet Robert Frost, buried deep in the poem titled “The Death of the Hired Hand.” They come to mind, on occasions like today, when I am headed off to the closest thing I have any more to that kind of a home — the place where you will always have a welcome, the place you somehow haven’t to deserve. My grandparents’ farm is gone. Though they lived there many years, they never owned it; it belonged to their son, my Uncle Billy. It was sold this year as part of the settlement of Billy’s estate. My parents are gone and the homes where they lived together, where we as children were born or grew, where we lived as a family while our parents’ marriage lasted, they were gone long ago. So that kind of a home for me isn’t a particular physical location any more. One year, it could be at my home. The next, at someone else’s. I am so very fortunate to be part of this amazing group pictured here. 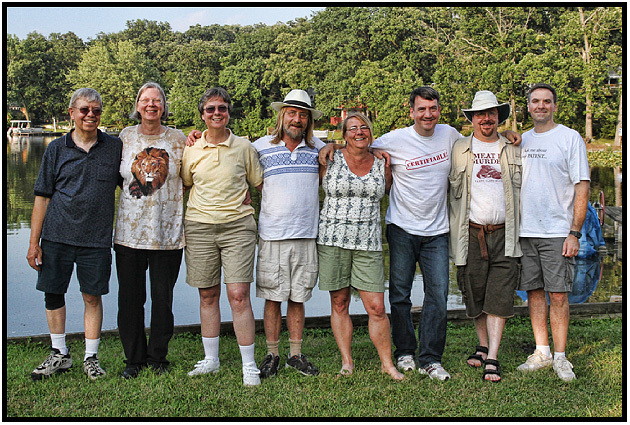 These are all eight of us — five brothers and three sisters — from left to right, Evan, Diana, Judy, Paul, Kacy, Fred, Warren and Bill. We are doctors, lawyers, educators, scientists. We are computer geeks and retirees. We have served the United States in both civilian jobs and in the military. We are high school drop-outs and graduate degree holders (and two of us are both high school drop-outs and graduate degree holders). We have married, divorced and married again. We’ve produced more than a dozen children for the next generation and we’re just getting started with the grandchildren (there are only four so far, but that number is guaranteed to go way up…). And getting as many of this bunch together as we can any time that we can is one of the great joys of my life. There has never been a day in my life when I haven’t been loved fiercely. Never a day in my life when I haven’t loved fiercely back. Even when I bitterly disappointed these folks, and I have — oh, how I have, there has never been a day in my life when they haven’t closed ranks around me and protected my back. So I’m off today, to spend Thanksgiving with as many of them as we can gather in one place at one time. That’s only half of us in one place today, not nearly as many as we’d like. We’ll miss the other half fiercely, but we’ll know, as we gather our half here in the east, that we’re loved and missed fiercely as well by those further south or west. We’ll be in their thoughts, as they will be in ours. And that, to me, is what being home for Thanksgiving is all about. I’m so glad you still have all of them in your life Judy! That alone is a blessing. Happy Thanksgiving. I couldn’t agree with you more, Roberta — having them still with me is such a joy, and I know you understand that only too well. Hope you had a good Thanksgiving as well! Such an eloquent post. I hope you have a lovely Thanksgiving with your family. Thanks so much for the kind words, Jana! We’ve had a wonderful day. Hope you did as well. Happy (belated) Thanksgiving to you and yours, Keith!